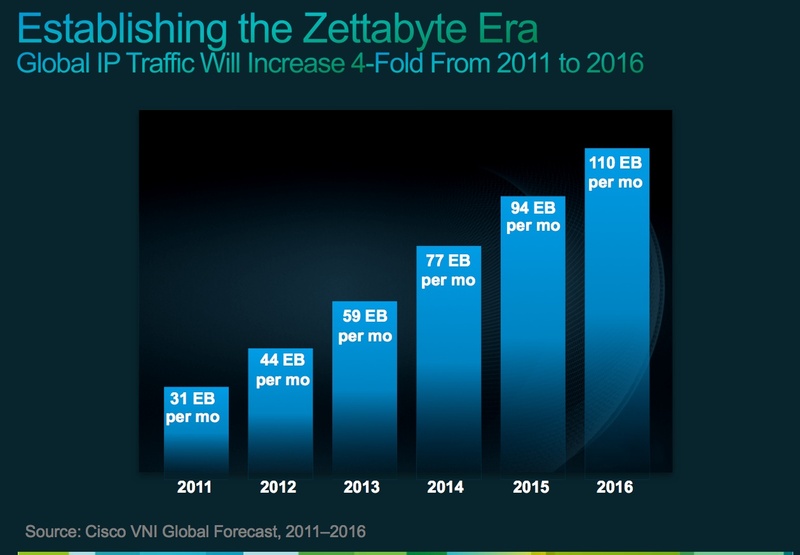 We’re on pace to generate 1.3 zettabytes of data in 2016, about four times more than we create today, according to the latest data out from Cisco (s csco). To put that in perspective, Cisco helpfully tells us that’s more than 38 million DVDs streamed in an hour. Or, you can think of it as a 1 followed by 21 zeros. The telecom gear maker offered up its fifth annual assessment of future broadband growth on fixed, managed and wireless networks around the world Wednesday. And to no one’s surprise, as individuals, households and countries we’re just going to keep boosting our broadband use. Around the world last year people generated 30.7 exabytes of data per month from a total of 10.3 billion connections. That’s a lot until you compare it to Cisco’s projections of the world generating roughly 110 exabytes per month from 18.9 billion connections. That’s a ton of growth, so what do the stats really tell us? 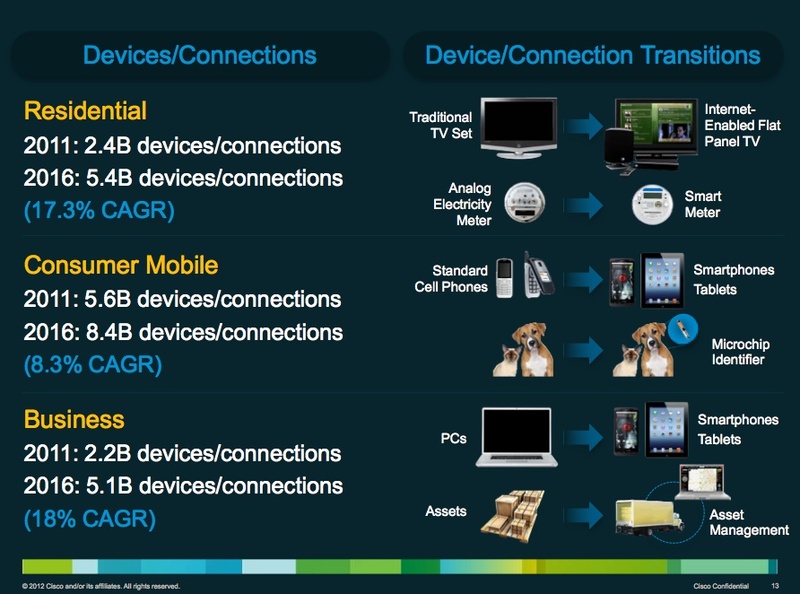 More web use, more users and more connected devices. Broadly it tells us the growth comes from existing users doing more online while toting more devices, and also from people around the world without connections today who are joining the World Wide Web. Cisco estimates that on average, individuals generated an average of 11.5 gigabytes of data per month. That’s a lot until you compare it to Cisco’s projections of an individual consuming an average of 32.3 GB per month. And as the chart below shows, we’ll be online and so will our vehicles and homes. Oh, the devices you will have! Part of what will keep us hooked on the web is a better experience thanks to faster speeds. 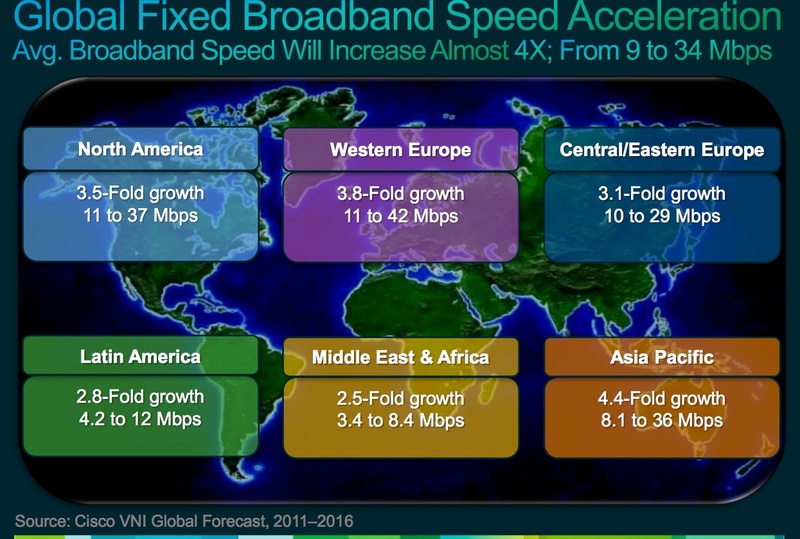 Global web speeds will rise from 9 Mbps to 34 Mbps. Unfortunately, 100 Mbps speeds and fiber to the home will still be a global rarity five years from now. Cisco estimates only 3 percent of web users will have 100 Mbps connections. We love the web and Wi-Fi, but what about data caps? With Cisco predicting average household web use reaching 150 GB per month globally in the unspecified future (beyond 2016 is as specific as the spokesperson could get), and given that U.S. residents are predicted to generate the most IP traffic of any country at 22 exabytes a month, Comcast’s 20 percent boost to its data cap this month had better be the first of many inflation-related upgrades. And they had better come a lot faster. It took Comcast 5 years to go from a 250 GB per month cap to the 300 GB per month cap. In five years Cisco expects North American traffic to increase by three-fold (this includes Mexico and Canada). And even though mobile growth is skyrocketing and will grow 18-fold in the next five years, it’s rising from a smaller base. Meanwhile, Wi-Fi is going to pick up a lot of the mobile network’s slack because of costs, caps and the growing availability of Wi-Fi networks. Cisco estimates that by 2016, over half of the world’s Internet traffic is expected to come from Wi-Fi connections. We’re going to need a lot more servers, storage and other equipment to both provide content and store all this data we’re sending, creating and consuming. The network is the transport layer for all those bytes, but machines still create and store them. And really, that gear had better be more energy efficient than the stuff we’re using today, or we’re going to run out of plants to power them. For those who care to dig in deeper, here’s Cisco’s web site discussing the survey, as well as our stories covering the first VNI report back in 2008 and another one in 2010. Cisco isn’t doing all that badly when estimating traffic data. In the initial 2007 release of the forecast, Cisco says it projected an overall IP traffic volume of 28.4 exabytes per month for 2011. The actual volume in 2011 was 30.7 exabytes per month, or about 7 percent higher than was projected five years ago. Our broadband networks are driving our computing, our economy and even our scientific discoveries. Cisco is showing us exactly how big that network is likely to become. It’s pretty awesome.